I had hankered after being a writer for many years, but had never had enough time to devote to it. Many people, meanwhile, had informed me that I had a talent for it, if only I could find the time. I finally got this opportunity when I was able to take early retirement from my day job as an IT Project Manager in the summer of 2012. The picture here is in homage to the first article I had published just before I left full-time employment. 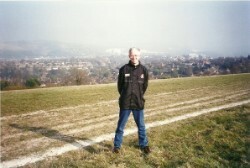 The feature was on the Barons' War of 1264-1265 and the picture shows me on the battlefield of Lewes. Being a History graduate and former History teacher, I inevitably write about a lot of historical subjects, but I also like to write 'travelogue' features, as I am well travelled both in the UK and the rest of the world. Please see 'Destinations' for a list of places that I have visited. Railways and Football are two of my passions, so these subjects are well represented amongst my writing credits. If you would like to see a list of the articles I have had published to date, please go to 'Published Articles'. At the moment I am writing articles for magazines, anything between about 800 and 5,000 words. I will write about pretty much anything, as I have the research skills to tackle almost any subject, as can be seen from the variety of subjects I've already written about. Wherever possible I aim to provide a complete package of words and pictures. Most of the pictures will be from my own personal collection (please see 'Photographs' for some examples). My ambition doesn't end with articles, however, and I have now finished off my first book, "Lesser Known Christchurch" for Roving Press. For full details see the 'Books' page. "Steve Roberts has worked several times for The Countryman and I have always found his work to be interesting, accurate, written to length – and on time!" (Paul Jackson, Editor, The Countryman).